A letterbox trap, high up on Langholm Moor. The Solway coast is visible in the background. One of the main features of Langholm was the abundance of letterbox traps. It sometimes seemed like there were traps on every hill, and watching one through a pair of binoculars, I saw three crows poised sulkily on the top beam as a call bird flickered and fluttered around inside. Nearby, a blackcock wandered through the white grass without a care in the world. The traps work like large lobster pots, and once they have slipped inside, crows find it impossible to escape. Their large size means that they are suitable for catching many crows at once, and if I can gather the materials together over the next few days, I plan to make one of my own for the Chayne. Crows are becoming more territorial by the day, and listening to a lone snipe sqeaking around his territory for the first time last night, it is clear that something needs to be done about them soon. 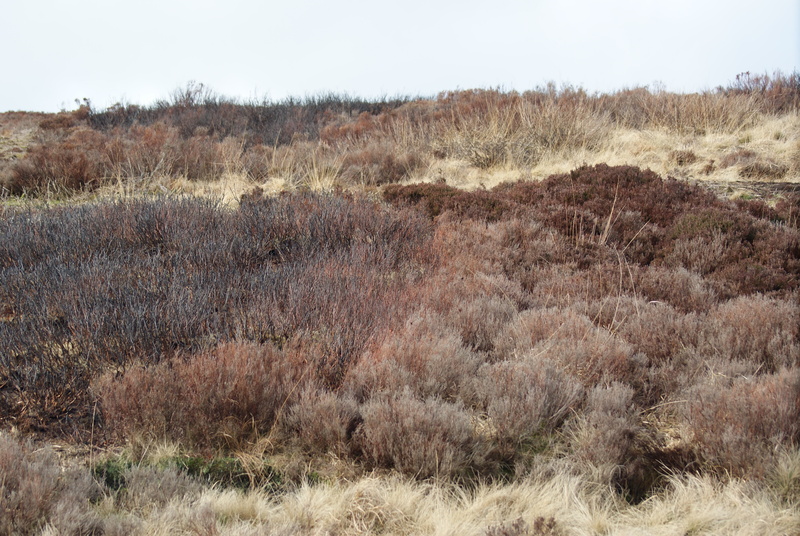 Heather beetle damage on Langholm moor (right), and attempts to burn off the dead plants (left). Langholm has to be the most famous grouse moor in Scotland. Sadly, it is not really famous for the right reasons. Controversy surrounding the issue of raptors saw the moor being used for demonstration purposes in the 1990s which caused a horrible crash in grouse numbers. The project was designed to advance the argument between shooters and conservationists, but instead it seemed to entrench both sides deeper than ever before after the publication of the project’s findings. 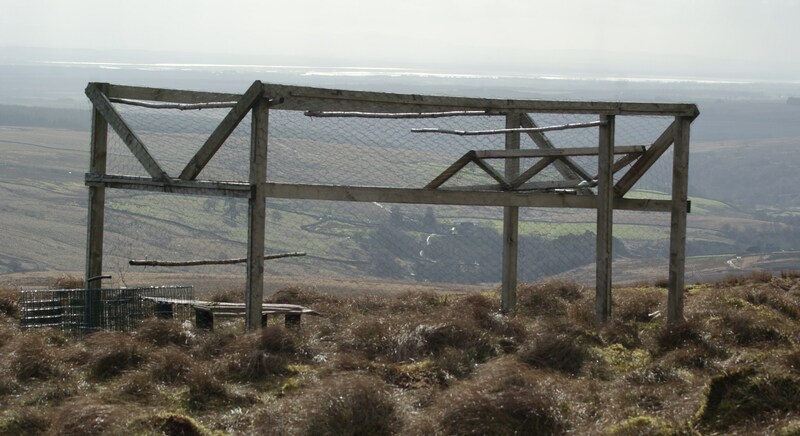 Since the end of the project, a variety of shooting and conservation bodies have been working together on Langholm, conducting experiments with the diversionary feeding of hen harriers and attempting to return the moor to the fine and well respected status it held before the beginning of the Joint Raptor Study Group. As you might imagine, progress is slow, and it is being hampered by the surprising veracity of one particular pest species. Having learned about heather beetle in various other contexts, I was vaguely aware of an irritating little bug which appeared now and again to eat the tops off ling. At Langholm, my eyes were opened. Dozens of acres of ghostly dead heather stand in contrast to scant patches of healthy undergrowth after a major outbreak of beetle, and many of these areas have been totally destroyed and rendered incapable of feeding grouse. Heather beetles feed on the leaves of heather, stripping it bare and preventing it from being able to photosynthesise. Also, the very process of being eaten dehydrates plants so that many will die if an infestation is followed by dry weather. Without human intervention, significant areas of Langholm could gradually become white ground over the next few years, and the potential for heather loss is dramatic. If neglected, grasses quickly grow up through the dead heather plants and choke out all surviving life, so many of the treatments for badly damaged moorland are based around either burning off the dead heather or cutting it out, and a great deal of hard work is going to be needed if grouse are ever going to flourish in pre-beetle numbers. Thankfully, heather beetle is limited on the Chayne, where heather is small and far between, but there is nothing anyone can do about big numbers of heather beetles, and they descend almost at random to spread chaos and misery across the uplands. You can spend thousands of pounds developing stands of quality heather, and they can simply vanish over the course of a few weeks when a heather beetles are in town. Nobody knows why they gather in such destructive plague proportions, but there is worrying evidence that it is increasing in frequency. This is clearly something that we need to get to grips with. This rather grisly article came into my possession today after it was found on the Langholm Demonstration Moor (more on this presently). It is the skull of a stoat, and it shows the incredible dental formula of my favourite wild mammal. The photograph above shows the skull beside a 1 pence piece, and it is clear to see that these little brutes are capable of packing a seriously nasty nip. The eye sockets are surprisingly large for an animal that is characterised as having beady little eyes, and despite the fact that this skull belonged to an animal which has been dead for several months, the teeth are still as sharp as needles. Flutter jumps, caterwauling and the whole nine yards. 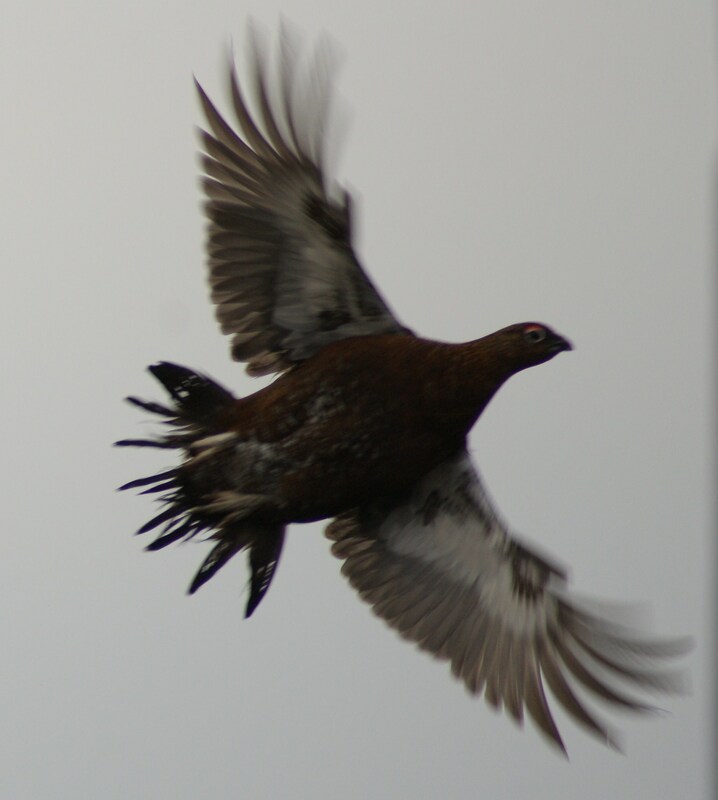 Although the blackcock have been bickering and squabbling for the past six weeks, they have only recently started their serious displays. Heading up to the farm this morning, I was delighted to hear a very familiar bubbling sound off in the distance. Stopping three quarters of a mile away from the property to open a gate for the car, I noticed that the wind was blowing in my direction. Vague snatches of conversational cooing were just audible, and I drove the final stretch with a smile on my face. After a brief search, I spotted a blackcock displaying at full bore on the hill above me. No more of the previous caution and reserve; flutter jumps, caterwauls and determined bubbling were the order of the day, and although he had no-one to display to, it made a fine spectacle in the gloom. After twenty minutes, a sour veil of rain started to smirr my glasses, and the blackcock began to lose enthusiasm for the job in hand. He quickly packed up his tail and headed for the shelter of the windbreak. In his absence, I headed off to check my traps, but when the rain cleared and I returned, he was back in the driving seat, displaying along the top stones of a drystone dyke. Despite persisent bad weather and early nightfalls, it seems like this bird has decided that it is spring time. Nothing will change his mind. And it’s not just black grouse who are full of the joys of spring. Red grouse are increasingly audible on the hillside at first light, and I took some photographs today of birds with decidedly flashy and conspicuous wattles (below) along the county line with the Scottish Borders. Red grouse seem determined not to miss out on the fun. Fluffed up in their winter coats, the ferrets have given hours and hours of pleasure. It has been a few days since I caught my first pregnant rabbit of the season, and catching another this morning effectively puts an end to the ferreting season. Working warrens where young rabbits are nesting makes for difficult work, and if nothing else, it is a waste of perfectly good rabbits which could be caught as adults in the autumn. While ferreting does work as pest control, I have been coming at it from a sporting angle, and there is little pleasure to be had when the ferrets simply go in and lay waste to young rabbits. The past few months have taught me a tremendous amount, not only about rabbits and ferrets, but also about the countryside as a whole. I have seen my boys working in a wide variety of different places, from heather hills to stacks of rotten tyres, and the pleasure of the sport is surely that you never know what is going to happen next. The amount of times that I have lost rabbits when they have bolted from concealed holes is beyond counting, and the number of bunnies who have earned their stripes by besting the ferrets would maybe be shameful to an experienced ferreter. I must say that if I can catch a single rabbit in an outing, I am delighted. I never get tired of hearing the deep rumble beneath my feet, or of watching my boys racing through the undergrowth like manic terrorists. They have accounted for 71 rabbits this season; not bad considering most of the trips I have taken have been stopped as soon as I had enough rabbits to feed them and myself, and I can remember almost all of them. Watching a rabbit emerge from a hole, only to be pulled back inside again by a ferret on his tail was thrilling, and seeing both ferrets catch a running rabbit which doubled back on them in an old shed is a tremendous memory. Ferreting is perhaps the truest field sport, where man and animal hunt together without the aid of guns or advanced technology. I have never had a working dog (although this will change as soon as is possible), but I finally begin to understand the pride a human can have in working together with his own animal. 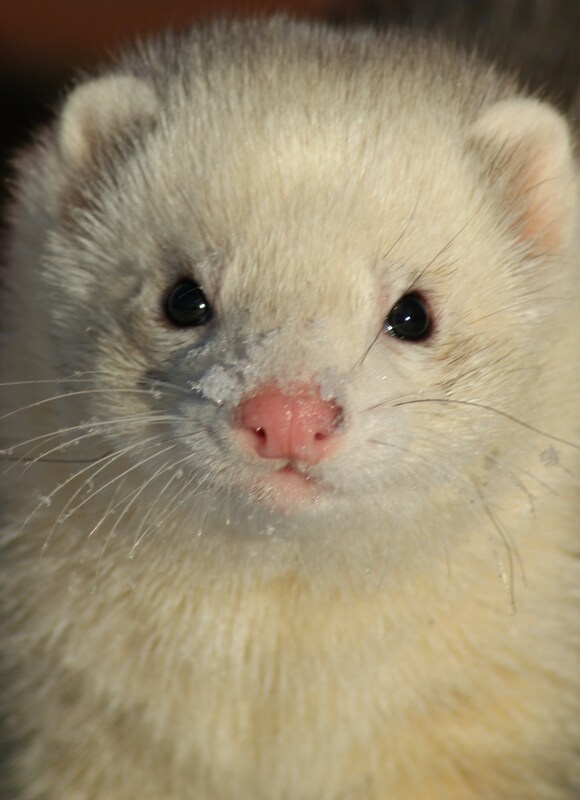 Ferrets are notoriously indifferent to the concerns of man, but there have been moments when I have seen them express the same amount of excitement, disappointment and pleasure as I have been feeling. The past few days have really seen spring come into its own. While snowdrops and crocuses have been up for a few weeks, I always prefer to look at wild animals for a sign of change. 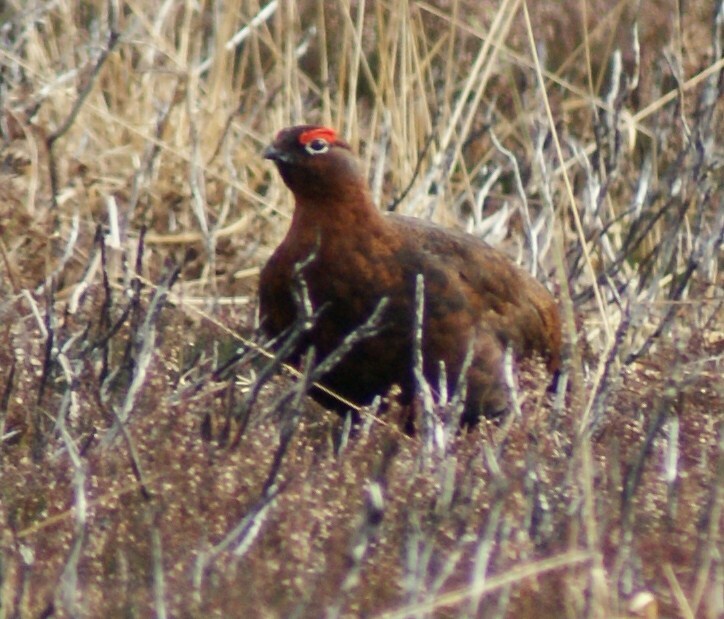 Boxing hares and battling pheasants have been a major feature since the second week in February, and I am on tenterhooks to see the start of the real black grouse lek over the next few days. Rooks are flying back and forth with twigs, and badgers are starting to emerge after their lazy winter underground. Today, though, I saw something that I have never seen before. Driving on a scenic route today, I was hoping to come across larger numbers of boxing hares, but it turned out that I came across something even more exciting. To begin with, I wasn’t sure what I was looking at. Leaves and dead grass were being flung into the road from the verge, and it started to become clear that two moderately sized birds were at each others’ throats. 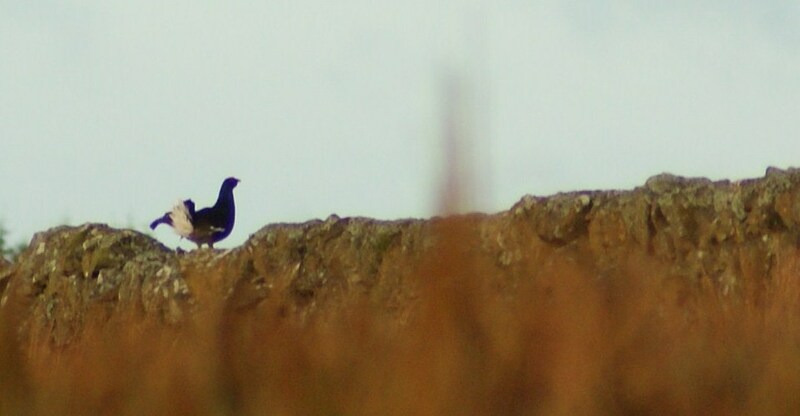 They were french partridges, and as I drove closer, it became clear that they could not care less about me. The conflict quickly produced a winner, and I watched as the lesser bird was battered and partially plucked into submission. They flickered frantically, then settled in to a race on the flat between the roots of an old hawthorn hedge. What the lesser bird had lacked in bulk and fury, he made up for with a fine fleetness of foot, and the race passed speedily by within feet of my car until honour was satisfied and the winner stopped to blink at me. 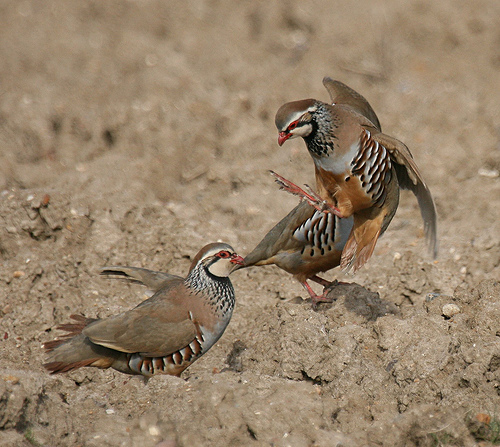 With large numbers of partridges in the vicinity, perhaps it is surprising that I have never seen a fight like this before, but normally they are so well concealed in the undergrowth that maybe I overlook them. I will be keeping a sharper eye out in future. Since posting about hen harriers on the Chayne two days ago, one or two self appointed pundits have been in touch with me on this blog. By leaving comments and personal slights on the site, they have shown the depth of feeling around this harrier/grouse debate. Since I work as a journalist and a copywriter, I am used to having my words heavily edited, and I hope that they in turn will forgive my decision not only to edit but to entirely erase their comments. In my defence, bogus “statistics” which supposedly prove that every grouse moor in Scotland is responsible for raptor persecution perhaps do not belong on my blog. I certainly seem to have stirred up something of a hornet’s nest with my post about hen harriers, although having re-read my own text more than once, I fail to see why. As explained in this blog’s introduction, I am passionately interested in Scottish wildlife. The fact that I also have an abiding love of shooting and country sports is supplementary to that interest, not in conflict with it. I happen to find grouse more interesting and exciting than raptors, and that is a matter of taste, not an indication of twisted and nefarious tendencies. I do not hold with the patronising school of thought which brushes my attitude aside as naive and unusual. I have been shooting for more than fifteen years and have worked as an underkeeper on a large shooting estate, gathering a fair consensus of shooting opinions during that time. It is plain fact that raptor persecution is a problem, but we should be careful not to overestimate its scale, and should be wary of totalitarian assumptions. While looking around at some websites this afternoon, I found furious and critical posts on the subject of raptor persecution from a variety of misinformed megaphones. One observer on a thread about hillwalking was concerned to see what he assumed was poison left out for raptors by a footpath (it was a grouse grit tray full of grit), and another was disgusted to find a pile of “poisoned” birds concealed in a patch of rushes (it was a fox midden filled with woodpigeons and rabbits). Whipped up by these moronic pseuds and stirred into a hyperbolic froth by conservationists who should know better, the British public has started jumping at ghosts, assuming the worst at the slightest provocation and interpreting the base acts of a sad minority as standard practice for keepers across our uplands. It is not only insulting for my conservation project to be deliberately misconstrued as an attempt to destroy birds of prey, but it shows just how out of touch some people are with shooting and country sports. Using recent national survey figures for hen harriers, it looks like I have 0.2% of Scotland’s population of breeding birds on the Chayne. That’s a large percentage for such a small farm in such a marginal area, but whether you choose to believe it or not, I am honestly pleased to have these birds around and will look into conserving them. Happily, much of the vermin control I have been working on to date also benefits these vulnerable raptors, as has also been shown to be the case on a number of other grander and higher profile moors. The floor is hereby closed for comments on this subject, and particularly to those which are designed solely to inflame and upset. What a load of utter nonsense.